Úrscéalaí, drámadóir agus iriseoir Francach ab ea Émile Édouard Charles Antoine Zola (2 Aibreán 1840 - 29 Meán Fómhair 1902), mar aon le bheith an scríbhneoir is cáiliúla as lucht scoil liteartha an nádúrachais, agus scríbhneoir tábhachtach i bhforbairt an nádúrachais amharclannaíochta chomh maith. Ba mhórphearsa é i liobrálú polaitiúil na Fraince agus bhí páirt mhór aige i saoradh mhilleán Alfred Dreyfus, oifigeach an airm a cúisíodh agus a ciontaíodh san éagóir, eachtra a taifeadadh sa cheannlíne nuachtáin cháiliúil sin, J'accuse (Cúisím, 1898). Cúisíodh é i leabhal dá bharr, agus theith sé go Sasana. Ainmníodh Zola do Dhuais Nobel na Litríochta den chéad agus den dara huair a bronnadh í, sa bhliain 1901 agus arís sa bhliain 1902. Rugadh Zola i bPáras sa bhliain 1840. B'innealtóir Iodálach é a athair, François Zola (nó Francesco Zola mar a tugadh air ar lá a bhreith), a rugadh sa Veinéis i 1795 agus a dhear Damba Zola in Aix-en-Provence, agus ba bhean Fhrancach í a mháthair. D'aistrigh an teaghlach go Aix-en-Provence in oirdheisceart na Fraince nuair a bhí Émile trí bliana d'aois. Fuair a athair bás ceithre bliana ina dhiaidh sin, sa bhliain 1847, agus fágadh a bhean chéile ina dhiaidh ag brath ar phinsin ghann. Sa bhliain 1858 d'aistrigh muintir Zola go Páras, agus chuaigh cara dá chuid óna leanbaíocht, Paul Cézanne, chun fanacht ina chuideachta leis ann. Thosaigh Zola ag scríobh sa stíl rómansúil. Bhí a mháthair ag súil go mbainfeadh sé amach gairm bheatha sa dlí dó féin ach theip air sa scrúdú Baccalauréat. Sula bhfuair Zola a chéad deis mar scríbhneoir, d'oibrigh Zola mar chléireach i gcomhlacht loingis agus ina dhiaidh sin i rannóg dhíolacháin foilsitheora (Hachette). Scríobh sé léirmheasanna ealaíne agus liteartha i nuachtáin. Mar iriseoir polaitiúil, níor cheilt Zola an mhíghnaoi a raibh aige ar Napoléon III, a raibh ina uachtarán de réir bhunreacht Dara Impireacht na Fraince, sular bhain sé lántairbhe as an údarás sin chun coup d'état a chur i gcrích, eachtra a cuireadh é i gcoróin mar impire. Le linn na mblianta tosaigh dá ghairm mar scríbhneoir, scríobh Zola go leor gearrscéalta agus aistí, ceithre dhráma, agus trí úrscéal, Contes à Ninon, a foilsíodh in 1864, ina measc. In 1865 tharraing sé aird na bpóilíní air féin dá bharr an t-úrscéal brachach a scríobh sé, La Confession de Claude (1865). Briseadh as a phost in Hachette é mar gheall air sin. Foilsíodh an t-úrscéal a scríobh sé, Les Mystères de Marseille, mar shraith in 1867. I ndiaidh foilseacháin a chéad úrscéil thábhachtaigh, Thérèse Raquin (1867), thug sé faoin tsraith úrscéalta darb ainm Les Rougon-Macquart a scríobh, cuntas faoi shaolta de lucht theaghlach sínte amháin sa Dhara Impireacht. Is iad úrscéalta den tsraith 20 úrscéil a dtugtar Les Rougon-Macquart orthu breis is leath den chuid úrscéalta a scríobh sé. Murab ionann Honoré de Balzac, a athchruthaigh a shaothair liteartha i gcruth La Comédie Humaine agus é i lár é a scríobh, bhí struchtúr an tsraith seo tharraingthe ag Zola ina aigne nuair a bhí sé 28 mbliana d'aois. Suite i nDara Impireacht na Fraince, scrúdaítear tionchar "timpeallachta" an alcóil, an fhoréigin, agus an striapachais ar shaolta na ndaoine sa tsraith seo, tionchair a bhí le brath go suntasach ní ba choitianta le linn an dara bhabhta den Réabhlóid Thionsclaíoch ná mar a bhí roimhe sin. Déantar scrúduithe ar dá sraith den teaghlach sínte amháin - an tsraith mheasúil (is é sin a rá na hoidhrithe dlisteanacha), na Rougons, agus an tsraith mhímheasúil (an sliocht mídlistineacha), na Macquarts – i rith thréimhse chúig ghlúine den teaghlach. 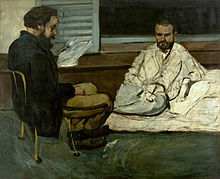 Cé go raibh cairdeas daingean idir Zola agus Cézanne óna leanbaíocht, d'éirigh eatarthu níos deireanaí ina saol de bharr an dealraimh fhicseanúil ar tharraing sé de Cézanne agus den saol boihéamach d'ealaíontóirí ina úrscéal L'Œuvre (An Sárshaothar, 1886). Fear saibhir ab ea Zola ó 1877 amach, agus bhain sé an-tóir as foilseachán an úrscéil L'Assommoir; bhí tuarastal níos airde aige ná mar a bhí ag Victor Hugo as sin amach, mar shampla. Le himeacht aimsire d'fhulaing sé a bheith mar cheann feadhna den lucht liteartha na meánaicme agus d'eagair dinnéir cultúrtha ina villa sóchúlach (ar íoc sé 300,000 franc as) in Médan, in aice le Páras ó 1880 amach. D'fhreastail leithéidí Guy de Maupassant, Joris-Karl Huysmans, agus scríbhneoirí eile ar na cóisirí sin. Tháinig rath mór air mar scríbhneoir, go háirithe de bharr foilseacháin Germinal in 1885, agus ansin foilseacháin trí leabhar "na cathracha" - Lourdes (1894) , An Róimh (1896), agus Páras (1897). Thagair Zola dó féin mar cheannaire an Nádúrachais Fhrancaigh, agus tá tionchar a shaothair le brath i gceoldrámaí éagsúla, leithéidí iadsan a chum Gustave Charpentier, go háirithe Louise, sna 1890í. Tá dealramh a shaothair, a spreag coincheapa na hoidhreachtúlachta (Claude Bernard), an Mainicéasaíochas Sóisialta, agus an Sóisialachas Idéalach, le brath i saothair Nadar, Manet agus Flaubert níos déanaí, freisin. Moladh Zola do Dhuais Nobel na Litríochta i 1901 agus arís i 1902. Ba Francach Giúdach é an Captaen Alfred Dreyfus, oifigeach airtléire in airm na Fraince. I mí Mheán Fómhair 1894, tháinig oifigigh Francacha ar faisnéis go raibh duine éigin ag scaoileadh rúin mhíleata d’Ambasáid na Gearmáine. Bhí drochamhras ag oifigigh shinsearacha ar Dreyfus mar gheall ar an fhrith-Sheimíteachais, cé nach raibh aon fhianaise ar aon éagóir ann ina leith. Triaileadh é in airmchúirt, ciontaíodh é i gcion tréasa, agus ionnarbadh é go hOileán an Diabhail i nGuáin na Fraince. Tháinig an Leifteanantchoirnéal Georges Picquart ar fhianaise a ciontaíodh oifigeach eile, Ferdinand Walsin Esterhazy, agus chuir sé a chuid ardchéimiúil ar an eolas faoi. Seachas beartú chun ainm Dreyfus a ghlanadh, rinneadh cinneadh Esterhazy a chosaint agus áirithiú nach gcealófaí an chéad fhíorasc. D’fhalsaigh Maor Hubert-Joseph Henry doiciméid a chuir an cuma ar an scéal go raibh Dreyfus ciontach agus ansin rinne sé cinnte de go sannfaí Picquart ar dhualgas san Afraic. Sular imigh sé, d’inis Picquart an méid a raibh ar eolas aige do lucht tacaíochta Dreyfus. Roimh i bhfad ghlac le Seanadóir August Scheurer-Kestner aird a tharraing ar an gcúis, d’fhógair sa Seanad go raibh Dreyfus neamhchiontach agus chuir sé i leith Esterhazy gurbh eisean a bhí ciontach. Diúltaigh an rialtas go gceadófaí an fhianaise nua, cuireadh Esterhazy ar triail agus saoradh é. Ansin cuireadh pianbhreith 60 lá i bpríosún ar Picquart. Chuaigh Zola i bpriacal go scriosfaí a ghairm agus araile ar 13 Eanáir 1898 nuair a foilsíodh alt a chum sé, J’accuse, ar chéad leathanach an nuachtáin laethúil L’Aurore. Ba ea Ernest Vaughan agus Georges Clemenceau a reáchtáil an nuachtán, agus ba iadsan a chinn go dtabharfaí foirm litir oscailte chuig an Uachtarán, Félix Faure. Chuir J’Accuse i leith gur chuir oifigigh ab shinsearaí in Airm na Fraince bac ar phróiseas an chirt. Níos measa bhí siad ciontach den fhrith-Sheimíteachais nuair a gearradh pionós príosúin saoil ar Oileán an Diabhail go héagórach ar Alfred Dreyfus. Theastaigh ó Zola a léiriú don domhan fianaise nua, a thacaigh cúis Dreyfus, i gcás clúmhillte. Ba chúis deighilte míltí idir an airm frithghníomhach agus an Eaglais Chaitliceach ar aon taobh amháin, agus an lucht cumarsáide a bhí ní ba liobrálaí ar an taobh eile. Lean le tionchar an cháis le blianta fada. Ar chomóradh 100 bliain fhoilseachán alt Zola, ghabh La Croix, nuachtán laethúil sa Fhrainc, a leithscéal maidir leis na heagarfhocail frith-Sheimiteacha a scaoil sé le linn an Teagmhais Dreyfus. Ba chor cinniúnach lárnach é foilseachán litir Zola san eachra toisc gurb dhuine mór sa saol poiblí é chomh maith le duine de na smaointeoirí Francacha ba cheannródaíche. Seo rud a tharla agus cuireadh Zola ar thriail ar 7 Feabhra 1898, ach ciontaíodh é ar 23 Feabhra agus cuireadh deireadh dá bhallraíocht sa Légion d’Honneur. Theith Zola go Sasana ionas nach mbeadh air tréimhse a chaitheamh i bpríosún. Bhain sé Stáisiúin Victoria amach ar 19 Iúil gan fiú dóthain ama beart éadaí a phacáil. Tar éis tréimhse ghearr mhíshásta a chaitheamh i Londain, ina raibh sé ina chónaí in Norwood Uachtarach (ó mhí Dheireadh Fómhair 1898 go mí Mheithimh 1899), tugadh cead dó filleadh ar an Fhrainc in am titim an rialtais a bhreithniú. Sa bhliain 1906, cúitigh an Chúirt Uachtarach Dreyfus go hiomlán. Aithnítear go forleathan gurbh é an t-alt sin a scríobh Zola in 1898 an comhartha ab shoiléire den chumhacht nua a raibh ag na hintleachtóirí (scríbhneoirí, ealaíontóirí, acadamhaithe) i múnla tuairimí an phobail, na meán cumarsáide agus an stáit. "Zola aux Outrages", (Henry de Groux 1898): ciontaíodh Emile Zola ar 23 Feabhra 1898 agus theith sé go Sasana. Sa bhliain 1862, tugadh saoránacht Fhrancach do Zola. In 1864, bhuail sé ar Éléonore-Alexandrine Meley (a thug Gabrielle uirthi féin). Bean fuála ab ea í agus ceaptar go forleathan gur striapach í. Phós siad ar an 31 Bealtaine 1870. D'fhan sí lena thaobh ar fad a shaoil iomláin agus bhí páirt lárnach aici le cur chun tosaigh a shaothair. Ní raibh clann acu. Bhí leanbh ag Alexandrine Zola sular bhuail sí ar Zola, leanbh a chuir sí chun uchtú toisc nach raibh sí in ann aire a thabhairt dó. Nuair a d'inis sí an rún seo do Zola i ndiaidh a mbainis, chuaigh siad ar thóir an chailín, ach tharla gur éag an leanbh tamall beag i ndiaidh a breithe. Sa bhliain 1888, chuaigh Zola leis an ngrianghrafadóireacht agus d'éirigh leis cumas sa cheird sin nach mór gairmeach a bhaint amach. Sa bhliain chéanna, fostaigh Alexandrine bean fuála Jeanne Rozerot agus cuireadh Jeanne fúithi i dteach Zola in Médan. Thit Zola i ngrá léi agus bhí beirt chlainne aige léi: Denise in 1889 agus Jacques in 1891. Nuair a d'aistrigh Jeanne go Páras, lean Zola ar aghaidh ag tabhairt airgid di agus ag tabhairt cuairte ar na páistí. I mí Mheán Fómhair 1891 tháinig Alexandrine ar an bhfírinne faoin gcaidreamh bradach agus is beag nár chríochnaigh an pósadh dá bharr. Nuair a cuireadh réiteach ar an gcoimhlint, áfach, bhí Zola in ann níos mó ama a chaitheamh leis na páistí. I ndiaidh a bháis, thóg siad a ainm mar a sloinne dleathach. Tugadh an leathanach seo cothrom le dáta an 23 Feabhra 2019 ag 22:42.